The first results from Broadband Genie’s annual Home Broadband Awards have been published, revealing that Virgin Media and Vodafone are the fastest providers for 2019. Broadband Genie partnered with speed test provider BroadbandUK and examined the results of 12,908 speed tests taken between July and December 2018. Virgin Media had the fastest download speeds, with an average 71.5Mbps, with Vodafone next quickest at 24.9Mbps. Virgin operates its own network separate from the Openreach phone lines used by most other ISPs and offers home download speeds up to 362Mb, which in most parts of the country is the fastest broadband available. However with around 65% of coverage Virgin is not a service that everyone can get (see our guide to Virgin Media availability for more). Among the Openreach network ISPs (available to the majority of premises) Vodafone had the fastest download speed, though this was only slightly quicker than EE and BT and not that far ahead of other providers lower down in the rankings. Not represented here are results from ultrafast fibre to the premises (FTTP) providers such as Hyperoptic. These would be expected to far outpace the mainstream ISPs but were not included due to the lack of results we have for these networks (only around 3% of premises can get FTTP at present). The roles were reversed for upload speed as Vodafone led with an average 10.1Mbps, followed by Virgin at 7.7Mbps. 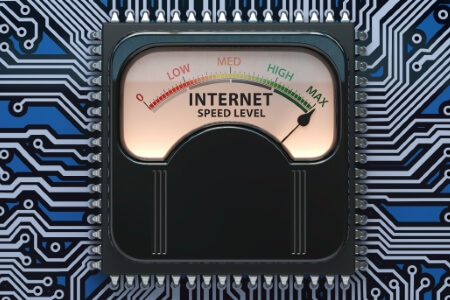 Upload speed has been less of a priority for providers as consumers have tended to make more use of the downstream, though it is becoming increasingly important. If you regularly upload to social media or stream video to services like YouTube and Twitch then upload is a crucial component. But until we can get access to high speed symmetrical connections like those offered by FTTP then upload speed is going to lag far behind download rates.